“No one can say ‘Jesus is Lord’ except by the Holy Spirit. It is in these words that the message of God this Feast of Pentecost, is focused. When we speak of Pentecost there are many thoughts that come to mind. As a servant of Christ from the tradition of the Charismatic church many would have expectations of how or what my message should be. For others the mention of Pentecost will mean the symbols of fire, water, wind or oil. In celebrating the gift of this third Person of the Holy Trinity we struggle to understand the infinite Spirit of God in terms our human mind can embrace. Even the use of pronouns is a quandery for some. Is the Holy Spirit to be expressed as a person..or “IT”? Is the Spirit of Christ to be thought of as HE or SHE in deferrence to those who like to dwell on issues of gender? The Gift of the Holy Spirit, given to ALL believers is about more than pronouns or symbols, the gifts of tongues or emotional fervor. It is in this holy mystery, the infinite fullness of God with which we are called to be filled, immersed, to be baptized. For it is the Holy Spirit that is given to lead us beyond our struggling selves, our futile intellect and understanding, to grow in fullness of Christ our Risen Lord. For in the the Feast of Pentecost we celebrate a profound change in the relationship of God with humanity. From special outpowerings of the Holy Spirit upon prophets and holy leaders we see the Presence of God given to ALL the faithful. We see it is the longing of our Heavenly Father that we would know the Presence of His Son through the fullness of the Holy Spirit. We all are called to EXPERIENCE the growing fullness of God in our everyday life. Let’s open our hearts to this gift as we explore some of those familar lessons of God’s Spirit. THE POWER of HIS PEACE: God well knew that the early church would be growing in an environment and time harsh and deadly to the things of God. Our Lord well knows we live in and environment and time that is seemingly as harsh and deadly to His Kingdom. We could easily fret and worry for all the problems that face our faith, our homes, our Church. But as Christ met with His followers He gave them His Peace. So it is today that the Holy Spirit would cause each of us in our journey and place in life to grow deeply rooted in the eternal, infinte and growing Truth of Christ and His holy loving peace. As we yield to the embrace of the Comforter, the Holy Spirit, in the challenges and heartaches of life we experience the hands of God rooting us ever more securely in the Rock of Christ our Risen Lord. It is in the power of God’s Spirit that we are rooted by the wood of the Cross in the empty tomb to know the promise and power of His resurrection. It is with the Holy Spirit we experience God’s “peace that surpasses all understanding” or circumstance. THE PURPOSE OF THE BREATH of GOD: The wind, the breath, of God blew powerfully upon the disciples in that upper room. So it should be in our lives today. God may whisper His plans and purpose for us in a quiet reading of the Scriptures or a time of reflection in the garden or before His Presence in the Blessed Sacrament. God may also blast us with His intent with gusts and gales of providential circumstance. The disciples were lead to diverse peoples and places by the circumstances of struggle they faced in Jerusalem. Our instinct would lead us to nest and stay in places of ease and comfort. But in Scripture and in life we see that while we are ever to be rooted secure in the truth and peace that is Christ we also see that the Holy Spirit may well fill the sails of our life to bring us to face and grow through needs, people, places and issues that His redeeming love would seek to embrace…through us. This holy breath of God will empower us to live in the freedom that is found where the Spirit sets us free. This holy wind of God will enflame the very fire and passion that will consume our doubts, fears and sins and enflame within the fire of Christ’s love.. THE FIRE of GOD: We experience the fire of God’s passion as we allow the Holy Spirit to lead us to greater love in Christ through His Cross. As Christ showed His disciples His hands and side He was calling them to enter in and share in the Passion of His Holy Wounds. It is in the power and comfort of the Holy Spirit that God will take our wounds, our brokeness and by uniting them with Christ’s bring us to healing, wholeness and the Passion of His love. 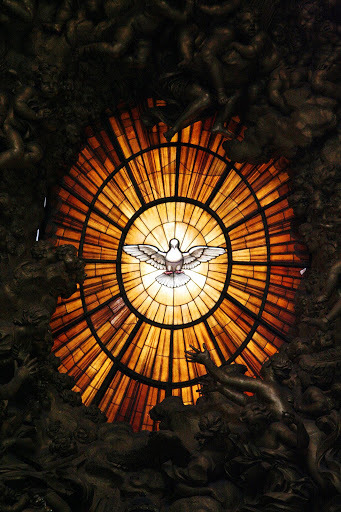 This day of Pentecost may we each, together, allow the fullness of the Spirit of God to fill these humble temples with God’s Presence and power. May we each grow and share our experience of living and proclaiming Jesus is Lord, by the Holy Spirit.